3 - 3...................Cora von der Mooreiche. 4 - 3,4................Brista vom Reuschenberg. 4,4 - 4,4.............Ali von Langenhorst. 4,5 - 4,5,5..........Bingo von Ellendonk. 5 - 4,5................Kim vom Stadtwald. 5,5 - 5,5,5..........Guys Hilo vom Norden Stamm. 5,5 - 5,5.............Biene von Niederkassel. 5 - 5...................Bronco vom Zenn. 2004: 90-96-92 = 278 points (6th). 2003: 93-96-98 = 287 points (1st). 2002: 96-96-96 = 288 points (2nd). 2003: 89-93-95 = 277 points (25th). 2002: 97-97-98 = 292 points (1st). 2001: 95-92-93 = 280 points (4th). 2003: 93-93-95 = 281 points (3rd). 2002: 75-94-91 = 260 points (29th). Arak vom Schwarzen Engel was the winner of the working IDC World Championship in 2003 with 287 points and runner-up in 2002 with 288 points. He was also the winner of the D.V. Meisterschaft in 2002 with 292 points and placed fourth in 2001 with 280 points. 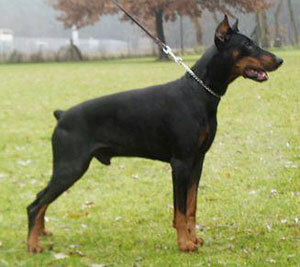 His dam, Rica von der Mooreiche, competed and placed 31st in the D.V. Meisterschaft in 1996.